I don't always make Easter cards for my girls, but this year I decided I'd make them one. 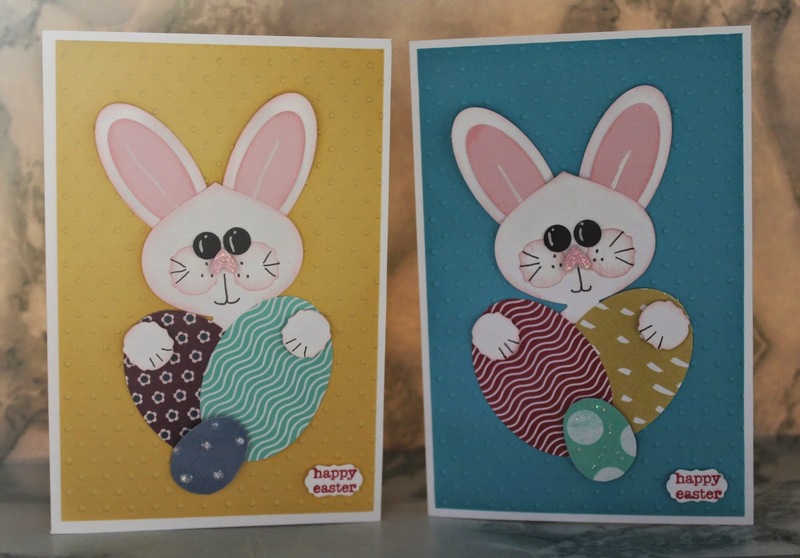 Inspiration came from Monika Davis and her Easter bunny with his carrot but I decided my bunnies would be holding Easter eggs instead. The bunnies were already pink and white so I couldn't really use my girls favourite colours (pink & purple of course) for the backgrounds, so I chose their next favourites instead - one likes yellow and the other likes blue. I hope you can see the dazzling details on the bunnies noses and on the small Easter eggs at the front. Its hard to tell from the photo but the small eggs and the noses are 'popped up' on dimensionals.